Earth Hour organisers are calling on sustainable businesses and individuals to stop being so shy about their achievements. The campaign has introduced a series of Earth Hour Awards for the first time this year and would like to see a greater number of entries from the capital. Canberra's Earth Hour business ambassador, Maria Efkarpidis, said Canberra had led the nation in switching off its lights during the campaign for the past two years so should have an abundance of sustainability leaders available for nomination. Ms Efkarpidis is director of the Rock Development Group and has already shown considerable leadership in researching sustainable building initiatives. 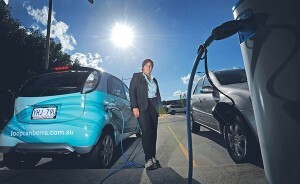 The company has installed the capital's first electric car charging station at the Belconnen Fresh Food Markets and plans to develop a $130 million green precinct at the same site. By 2015 it hopes to have built a further six office and retail buildings that utilise geothermal heating and cooling, installed rainwater tanks and energy-saving technologies as well as provide community rooftop gardens. It has also funded Canberra Capitals captain Jess Bibby to drive an electric car to schools to deliver an education program on healthy eating and living. Many Canberra businesses, like Ms Efkarpidis's, would qualify for the Earth Hour Workplace Champions award but there are other categories for other ages and individuals. Entries for the awards close on Sunday. Earth Hour will be on March 26. For more information, visit www.earthhour.org.au.